In 2016, FOX television and Warner Bros. teamed up to bring the hit 80s action movie series Lethal Weapon to the small screen. While the idea seemed doomed to fail from the start, the end result was easily one of the most fun and exciting shows on television today. Little-known actor Clayne Crawford filled the shoes of Mel Gibson to play Martin Riggs — a troubled, loose-cannon police detective struggling to live life after his pregnant wife had died in a car accident. He was teamed up with the more play-it-safe, by-the-book Roger Murtaugh, played by Damon Wayans who reprised the role made famous by Danny Glover, and the two made a pretty fun and explosive duo. Season One ended with some major conclusions to the mystery behind Riggs’ wife death, leaving some to wonder where it might all go next. The show experienced a tremendous shake-up at the end of Season Two when news of fighting between the show’s leads broke and Crawford was accused of abusive behavior toward some cast and crew (while plenty of complaints about Wayans’ apparent “diva” attitude on set were also made). And just as quickly as the news broke, the season rolled to a stop with some uncertainty about its future–including for the character of Martin Riggs. And as anyone who’s followed the show knows, with it in its third season right now, Clayne Crawford had been fired and replaced by a new character, named Cole, played by Seann William Scott. 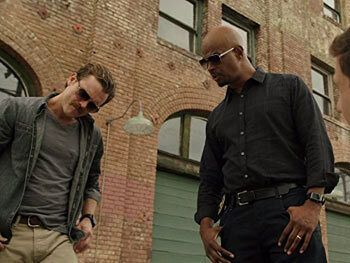 Sadly, this cast a very large shadow over the first two seasons of Lethal Weapon AND the following third season. But fans who’ve stuck with the show (despite strong feelings either way) have largely found that the third season, with Scott paired with Wayans’ Murtaugh, actually works and is almost as entertaining as its preceding two seasons. Still, Crawford as Riggs had brought something really special to this show, and the void his exit left behind is still palpable. With all that said, Season Two had big expectations to meet. While Season One had to follow a very popular franchise and live up to its legacy, Season Two had to measure up to the super enjoyable first season. With the plot about Riggs’ wife’s death mostly resolved, Season Two largely focuses on Riggs’ relationship with his abusive father, Nathan Riggs, played by Rex Linn. It works pretty well as the season’s arc story, but it certainly takes on significantly different meaning and weight upon seeing how the show plays out at the end of Season Two into Season Three. But it’s also a much darker arc than the first season had (believe it or not). Season Two even opens with a blood bath in Mexico, when Murtaugh ventures out to find his partner who basically went on a suicide mission to eradicate anyone remotely responsible for his wife’s death. It was a brutal start to the new season, but it also brought back that fun and heartwarming dynamic that the two leads had together. Crawford has such an incredible ability to make you feel for and relate to his character with just his eyes, and it wasn’t hard to empathize with his character through Riggs’ journey. And just when you think he’s on the mend mentally and emotionally, the ghosts of his past–namely his father–come back to shake things up once more. The presence of Nathan Riggs is often dark and disturbing, too. While we saw Martin dealing with heartbreak and thoughts of suicide from the loss of his family in the first season, now we’re getting flashbacks to when Nathan would emotionally, and sometimes physically, abuse Martin, and it makes the drama all the more intense and affecting–especially when the poor guy just wants to move on with his life. A couple episodes keep us guessing if Nathan is even still alive, and when we inevitably find out he is, the emotional element deepens. Meanwhile, Murtaugh and his wife are dealing with their son going off to college, as well as some other drama with their daughter, which is all mostly comedic in nature, and this helps to balance the far more weighty elements in Riggs’ personal life. While the original films were all rated R, the show is definitely more of the PG-13 variety–although a hard one, as Season Two does up the ante with the more violent contant. The aforementioned season opener, “El Gringo Loco” is full of bloody gun battles and aftermath scenes as Riggs goes on a rampage in Mexico (and Roger goes to save him), while other episodes are far tamer with a lot less violent content. But then you have an episode like “Double Shot of Baileys,” where we see the episode’s victim in bed with a girl (who is in lingerie), and when he goes to answer his hotel door, he gets an ice pick in the face (and we see it sticking out of his eye socket). In “Fools Rush In,” a body is found with a bloody bullet hole in a man’s forehead in a dumpster; in “Fork-Getta-Bout-It,” we see a man get stabbed in the neck and then see a closeup of it sticking out with blood running off of it; in “The Odd Couple,” a man at a construction site is impaled through a trailer wall on the ends of a fork lift; to name a few more examples. We also see scenes taking place in the morgue with the victim’s body on the table (in varying states of goriness, depending on the murder) in some episodes. Some flashback scenes in a few episodes involving Nathan Riggs have bloody or violent aspects, with the worst instances involving nightmares that Martin has where he keeps seeing his father with part of his face bloodied and missing. In “Birdwatching,” he dreams his father is lying on a beach with his mouth and cheek bloodied and gory, then remembers the moment from his past where his father was shot in the face. Worse yet, later in the same episode, he dreams his father is in his trailer, frying up a piece of what appears to be skin from his face, which he makes Martin eat a forkfull of. During this sequence, Nathan’s face looks bloodied and disfigured in a very disturbing way. Throughout the season, Martin still struggles with alcoholism and even using marijuana to try to cope with the emotional pain he feels. The series is definitley NOT one for the whole family, but it does have redeeming qualities with its do-gooding heroes and likeable characters. When it’s not gross with its violent content or emotionally heavy, it really can be a fun and exciting series to watch–even in its current season sans Crawford. The occasional rough content is the only thing holding back a higher rating from me or a definite recommendation. It’s a solid action-comedy buddy cop show with some deeper, dramatic themes for the viewers to sink their teeth into. It’s entertaining, fun, and even relatable. If you liked Season One, Season Two is a worthy continuation, however, there’s a finality to the continuity of the show at the end of this season that sort of completes the series if you never want see a single episode without Riggs. But, in all honesty, after the dust has settled over the wealth of controversy that surrounded this series last year, Season Three, with Scott paired up with Wayans, offers enough of what was enjoyable about the show from the beginning to be worth tuning into… but I guess we’ll have to wait and see where things might go from here, if a fourth season will even be a reality or not. 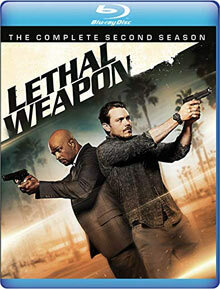 Lethal Weapon: The Complete Second Season is available with all 22 episodes in a 4-disc Blu-Ray set (without Digital HD streaming copies, unfortunately) or a 5-disc DVD set. The special features are pretty thin for this set, which didn’t surprises me much this time. The only bonus features we have here are deleted scenes for select episodes on each disc. Deleted Scenes: “El Gringo Loco” (3:25) – In the first scene, Riggs and Roger look at their prisoner in the trunk of their car and talk about it. Next we see Roger covered in blood at the hospital, which freaks out a nurse. The third scene shows Riggs sitting in the morgue where he realizes who killed the mob boss after something that Scorsese says (What’s interesting is that the “dead body” is visibly blinking and breathing as this shot starts!). Finally, Trish finds Riggs and Roger asleep on the couch in the baby’s room (They should have left this one in!). “Dancing in September” (3:14) – First, Roger gets reprimanded by the deputy chief for being reckless at his age (while he still thinks she’s flirting with him when she isn’t). Next, Captain Avery visits Scorcese at the morgue where he up a mash of stomach contents, grossing out Avery (it IS pretty gross). 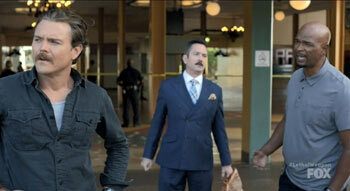 In the last scene, we see Riggs and Murtaugh at the station talking about the case. “Flight Risk” (2:36) – In the first scene, Avery is caught by the deputy chief covering for Riggs and Roger who forged his signature. The next scene follows this up as he admits to her what happened but supports them. Finally, Roger and his daughter are standing in the precint after the case and he makes a snarky remark to her. Deleted Scenes: “Fools Rush In” (2:37) – Riggs and Dr. Cahill evaluate a suspect outside the interrogation room. Next, Roger and Trish talk about preschool for their daughter. “Wreck the Halls” (4:40) – Molly addresses Martin’s apprehension toward them acting like a family. In the next scene, Roger visits the morgue and Scorcese has a mistletoe hat for Bailey. Next is a flashback of Martin’s face getting sewn up after his dad was shot. He then visits his dad in the hospital (his very bloody face is visible), where Nathan tells Martin to kill him! Molly then walks in and takes Marin out. It’s a very intense sequence, and definitely one that makes his relationship with his dad more complex. Deleted Scenes: “Diggin’ Up Dirt” (4:36) – In the first scene, a girl hits on Riggs in a bar and then it cuts to him with Dr. Cahill, telling her he told the girl he has rabies (to avoid talking with her). In the next scene, we see Roger and Monty in the bullpen and they worry about layoffs. Finally, the city councilman visits Avery and warns him that Riggs could cost him the election. “Better Living Through Chemistry” (2:52) – Roger runs into Deputy Chief Santos and accidentally comes across as stalkerish. Next, we see Roger feeding their baby and talking to her about what to do about RJ as Trish walks in. “An Inconvenient Ruth” (1:30) – Roger and Avery talk about Riggs and then see video of Roger getting stuck in a playground pipe slide online on Bowman’s computer. He and Avery then talk about getting older. “Ruthless” (4:00) – Captain Avery argues with a fellow officer and friend about their respective loose cannons (i.e. Riggs and Booker). Next, Roger gets a tip call from a girl who’s actually interested in him and he tells her he’s happily married. Lastly, Roger talks down Booker from shooting a bad guy. Deleted Scenes: “Leo Getz Hitched” (2:26) – Roger and Trish hide in their bedroom to avoid talking to Riana. In the next scene, Riggs talks to Molly’s son about his father being in trouble and in prison again. “Family Ties” (5:58) – Roger and Trish talk about him getting to be interim captain as she goes off to work, too. In the next scene, the two Face Time chat and share about their disappointing day when Leo walks in. Lastly, Leo visits Trish at their house and gives her a book he recommends. “One Day More” (4:58) – Captain Avery talks to Roger about Riggs’ dad trying to kill him and about Roger maybe becoming captain. Next, Nathan talks to his other son who is in prison. In the next scene, Avery tells Riggs he could try to stop his brother’s transfer, but he says to let it play. Finally, Nathan tried to get Trish to transfer money, but she stalls.